I decided to make these just before my mum was visiting for the week, knowing that she loves cheese straws. Can’t say I mind eating them, either. I assumed these wouldn’t take too long to make. In terms of mixing the dough, I was right. It’s slightly different to a normal dough in that you add celery salt, paprika, grated Red Leicester cheese and cheddar. Cutting out the straws, however, was a total faff. Once you’ve rolled out the dough, the recipe states that you should cut out 6 inch long pieces which are quarter of an inch wide. Now, I don’t know if y0u’ve ever cut food into 1/4 inch (or 6mm) pieces, but it’s SMALL. And once you’ve cut out these tiny straws, you need to bend them over into fish (icthus) shapes. If they don’t break at this point, they will when you pick them up to put them on the baking tray ready to go into the oven. 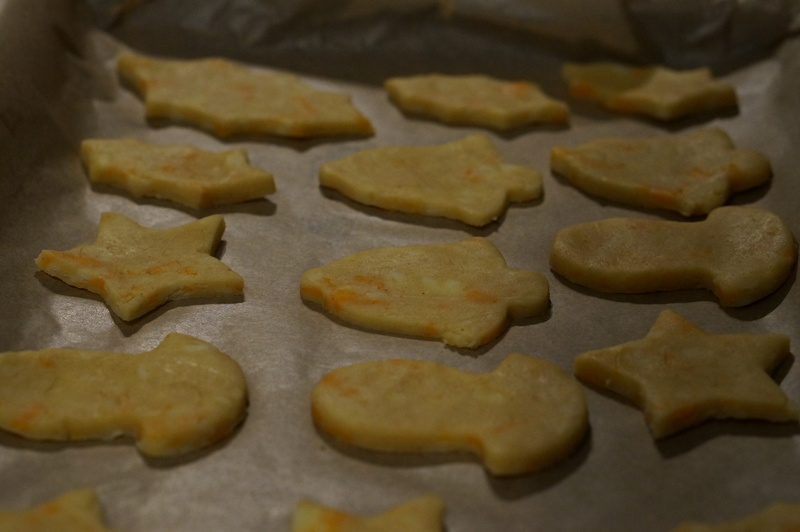 Somehow I managed to salvage a number of them, but in the end I gave up and just did larger fish shapes. They only take 10 minutes or so in the oven (if they’re larger they take a little longer), but regardless of the faff above, they’re pretty tasty. Hubby and I ate a third of them the evening I made them – and had to resist eating more so there were some left for my mum. Oops. I would advise not trying to make them 6mm wide each though – you don’t need to for them to taste (and look) good. I’m probably writing about these a little late, but over the Easter weekend I did a range of baking, primarily in preparation for a Bank Holiday visit and Easter Egg hunt with four toddlers (and their, rather hungrier, parents). This is the first of three bakes I made. Once again, it’s a relatively simple recipe from Hallelujah! Easter cook book, in order to make my life simple. You melt together butter, golden syrup and chocolate, then add this mixture to bashed up biscuits, raisins and rum. Once the mixture has cooled slightly you add marshmallows (unless you’re making the vegetarian version to keep your husband happy, in which case you leave out the marshmallows altogether. I did both – some w ith, some without). Once you’ve poured the mixture into a baking tin, all you need to do is leave it in the fridge to set. 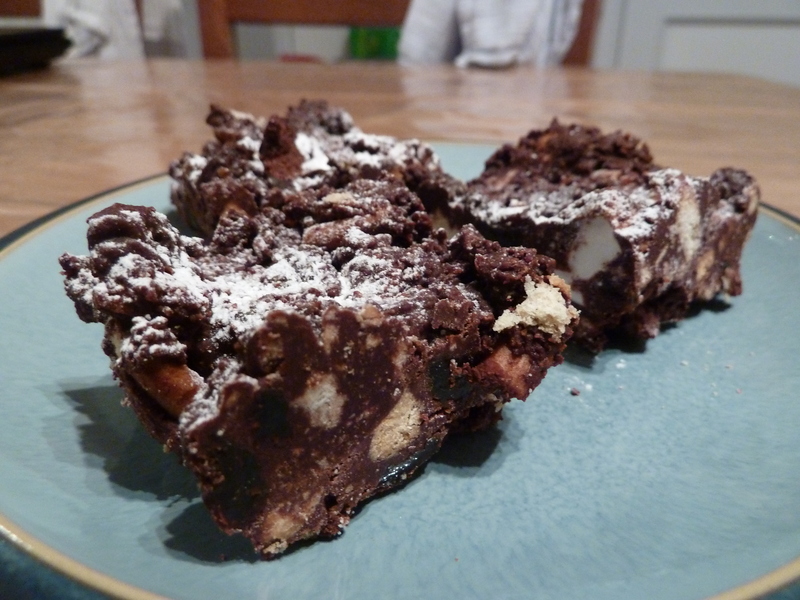 No oven needed, and the result is some very chocolatey rocky road. Having made quite a lot of bakes over the past few days, I wasn’t sure how many more I could be bothered to do of what I had planned. 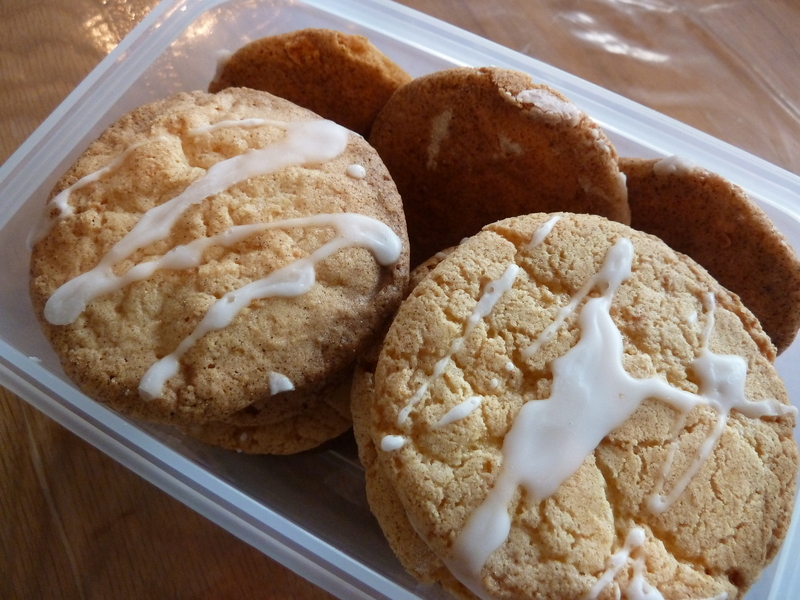 Then I looked at the recipe for these… they are so, so easy to make! Probably the easiest shortbread I have ever made, you simply mix together plain flour and caster sugar, and add lots of margarine. It takes a while to incorporate all the margarine into the dough, but once you have you just roll it out and cut out star shapes. Even that’s easy, because it’s shortbread so you roll the dough out fairly thickly. 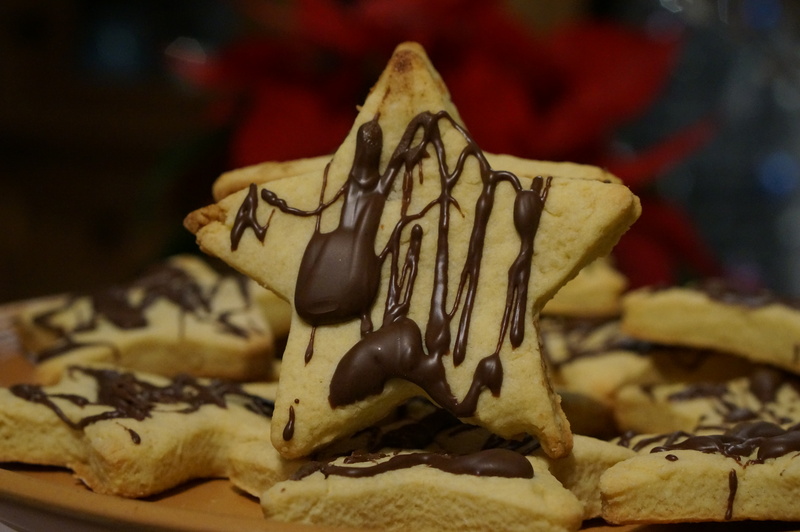 You then put the stars into the oven for 15-20 minutes, let them cool, and add some melted chocolate (I just drizzled it over with a spoon, but there’s no reason you couldn’t do something more fancy). The whole process took no more than half an hour – which was perfect as I made these sandwiched between making my Christmas garland fairy cakes and my aromatic Christmas ham. And they even taste pretty good! 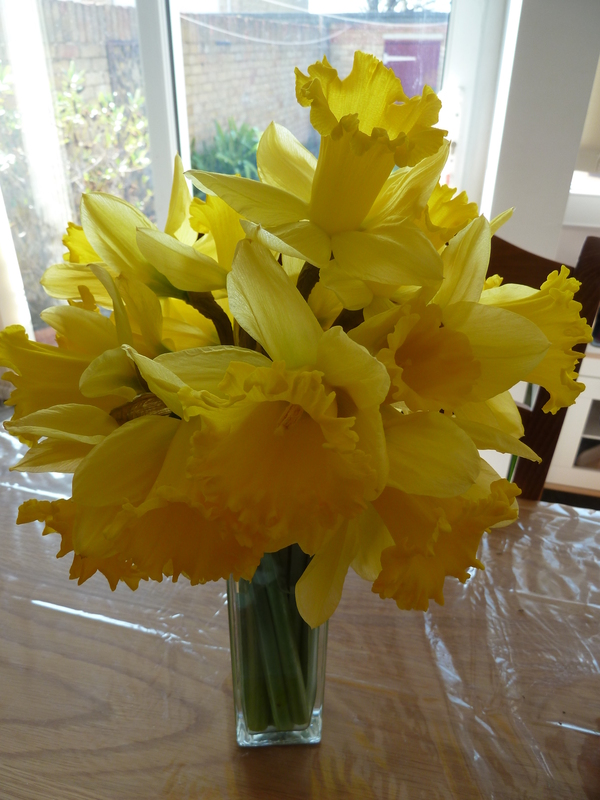 In contrast to the Christmas star fairy cakes, these were really easy – and fun – to make. I made the full batch of 50 or so biscuits, so that we had some for the host of people visiting us over the weekend before Christmas, and some for our Christmas visitors as well. The recipe for these is basically flour, cheese, a couple of spices and an egg yolk, and it’s a really easy dough to mix together and roll out. You do need to leave the dough to chill in the fridge for 30 minutes, but other than that it’s just a case of rolling the dough out, cutting out shapes (I used a variety of festive-looking stars, holly and bells cutters etc.) and baking them in the oven for 10 minutes or so. This was another tasty treat for us to eat during the run-up to Christmas. Well, I say us – I cruelly added marshmallows so that Dan couldn’t eat any. But I really like marshmallows, and my friends and I enjoyed them! 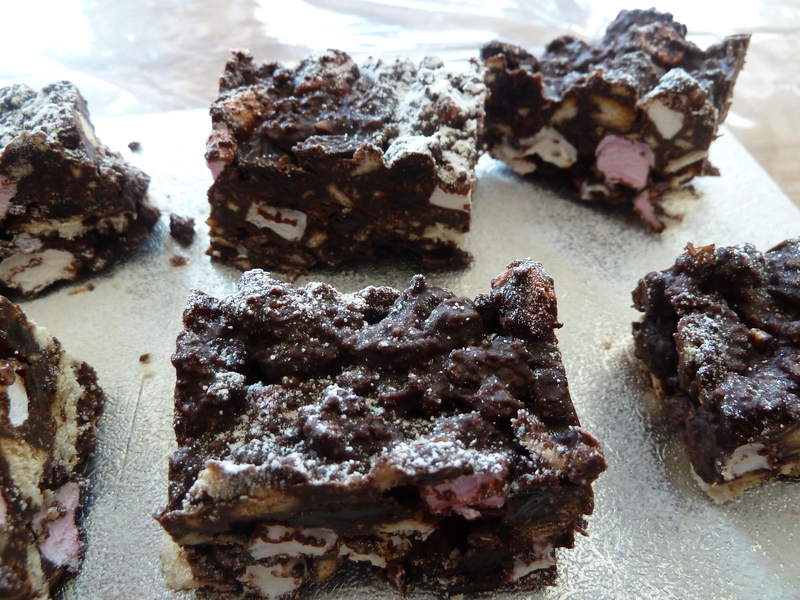 Rocky road isn’t actually that hard to make – there’s no baking, and the toughest part of the whole experience is probably bashing up the biscuits into the correct-sized chunks. Once you’ve done this, you melt together butter, plain chocolate and golden syrup (in a bowl over a pan of simmering water, not in the pan like I originally nearly ended up doing – I should know better). Then add the bashed-up biscuits, some rum (’cause, well, it’s rum) and some raisins (’cause that makes it healthy), wait for the chocolate mixture to cool down, and add the marshmallows (if you add them too soon they melt). Then stick the whole gooey mess in a tin and put it in the fridge to harden. Nice and speedy, and makes a lovely (if horribly unhealthy) treat. Another Halloween treat, I wanted to make this for an event so that Dan and I wouldn’t be the only ones eating it. This was because a significant element of this pie is marshmallow, which Dan won’t eat as a pretty strict vegetarian. As it turned out, I ended up using vegetarian marshmallows anyway (which really don’t taste all that different), so Dan did get to try it. I have no idea why, but at the end of October normal marshmallows (and more specifically plain white ones, which is what I was after) disappeared from the shelves everywhere. We hunted in a number of shops before giving in and using a health food shop to buy the veggie version. Anyway, onto the pie – which, by the way, tasted amazing! I will definitely be making this again. You begin by making a chocolate biscuit base (just like a cheesecake base). You then melt down your marshmallows, add a little green food colouring and some peppermint essence, and top the base with this. Chill this in the fridge before whipping cream and adding this to the top of the pie. Finally, because this was Halloween I endeavoured to make some chocolate bats by melting some dark chocolate, then cutting out bat shapes. They didn’t look great, but definitely added to the lovely minty taste of the pie. The pie went down really well with everybody who had some. After the baking extravaganza that was my son’s 2nd birthday, I did have a bit of a break. I started baking again when I knew my parents were coming to stay for a few days whilst hubby was away at a conference. The first thing I decided to make were these chocolate chip cookies- the September recipe from my Home Baking 2014 calendar. Nice and easy to make, it’s a fairly standard dough with brazil nuts and dark chocolate chips stirred in at the end. As normal, I left out the brazil nuts and just added the chocolate. The entire bake took about half an hour, and the end result were some tasty, very chocolatey cookies. Hubby (who tried a couple before he left) felt that they were a little too chocolatey, but I informed him there’s no such thing. And so, the piece de resistance – a birthday cake that a 2-year old will love. As the title suggests, this cake actually required very little baking. This was a choice I made for two reasons; I recently made a work-intensive cake (see my baby in a pram party cake), and as I have already mentioned, my son isn’t a huge cake lover. What he does love, however, are chocolate fingers and biscuits. And trains. He really, really loves trains. That made this cake the perfect choice for him and me. 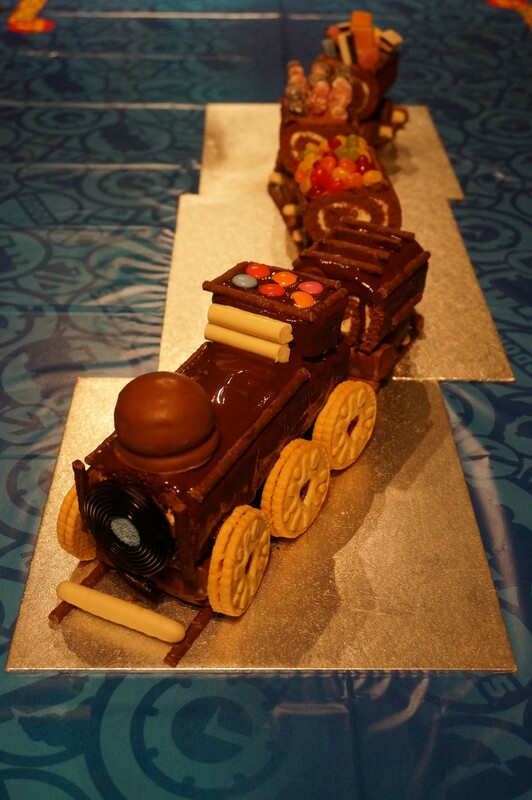 The idea behind this cake is that you buy a whole load of food that you wouldn’t normally let your child eat (chocolate fingers, chocolate swiss rolls, sweeties, jammy dodgers, chocolate Matchmakers etc), that put them together in order to form the shape of a train. It actually works really, really well – and took less than an hour to do, which I wasn’t expecting at all. We’d given ourselves a whole evening to put it together. 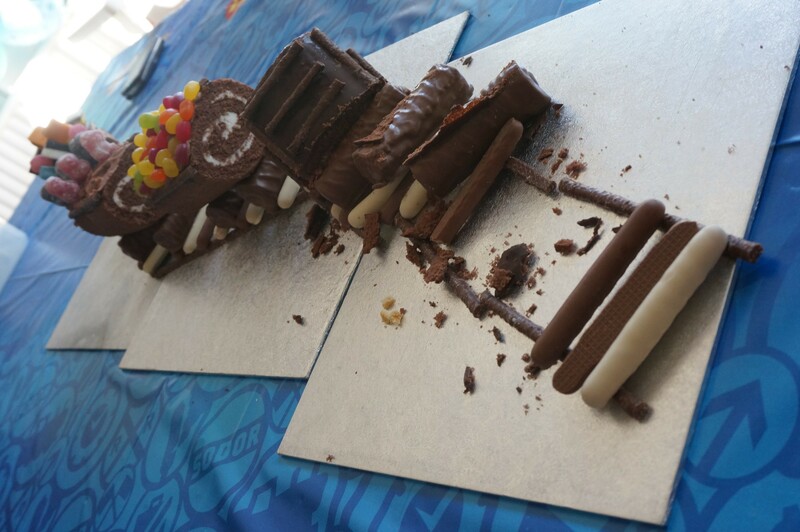 The only things I did make were some chocolate buttercream (so that the sweeties and biscuits stuck on to the carriages), and I melted some chocolate to coat the engine. The latter wouldn’t have been necessary if we’d bought chocolate-coated swiss rolls, but we hadn’t. The reaction from our son, and other guests alike, was totally worth it. Everybody was impressed beyond the effort that had gone in to creating the cake. Plus, you can make the train any length you like, meaning it can feed as many – or as few- guests as you want it to. Needless to say, we made way too much.